Background and objectives Studies examining dose of continuous renal replacement therapy (CRRT) and outcomes have yielded conflicting results. Most studies considered the prescribed dose as the effluent rate represented by ml/kg per hour and reported this volume as a surrogate of solute removal. Because filter fouling can reduce the efficacy of solute clearance, the actual delivered dose may be substantially lower than the observed effluent rate. Design, setting, participants, & measurements Data were examined from 52 critically ill patients with acute kidney injury (AKI) requiring dialysis. All patients were treated with predilution continuous venovenous hemodiafiltration (CVVHDF) and regional citrate anticoagulation. Filter performance was monitored during the entire course of therapy by measuring blood urea nitrogen (BUN) and dialysis fluid urea nitrogen (FUN) at initiation and every 12 hours. Filter efficacy was assessed by calculating FUN/BUN ratios every 12 hours of filter use. Prescribed urea clearance (K, ml/min) was determined from the effluent rate. Actual delivered urea clearance was determined using dialysis-side measurements. Results Median daily treatment time was 1413 minutes (1260 to 1440) with a total effluent volume of 46.4 ± 17.4 L and urea mass removal of 13.0 ± 7.6 mg/min. Prescribed clearance overestimated the actual delivered clearance by 23.8%. This gap between prescribed and delivered clearance was related to the decrease in filter function assessed by the FUN/BUN ratio. Conclusions Effluent volume significantly overestimates delivered dose of small solutes in CRRT. To assess adequacy of CRRT, solute clearance should be measured rather than estimated by the effluent volume. Acute kidney injury (AKI) is common in the intensive care unit (ICU), with an incidence varying from 30% to 55% using the Acute Kidney Injury Network diagnosis criteria (1–4). Approximately 15% of the patients with AKI in the ICU will receive dialysis (5). Despite substantial advances in dialytic techniques, mortality in the critically ill population with AKI remains alarmingly high, approximating 50% for AKI requiring dialysis (6–8). Several randomized clinical trials have compared high-dose dialysis with conventional-dose dialysis in an effort to enhance survival and reduce complications associated with severe AKI. Since 2000, three studies have suggested improvement in outcomes with a higher dialysis dose (9–11); however, most recent trials did not confirm this benefit (12–15). Most of these studies have prescribed weight-based hourly effluent rate and considered the effluent volume as the delivered dialysis dose. However, solute clearance may be compromised in delivering the prescribed dose continuously because of concentration polarization of the filter, filter clotting, and other factors including access-related problems and external ICU procedures (e.g., surgery, imaging, or other diagnostic studies) that can reduce total treatment time (16–20). Urea clearance derived from the urea mass removal from the effluent provides an accurate assessment of small solute removal delivered with continuous renal replacement therapy (CRRT). We hypothesized that in AKI patients treated with CRRT, the prescribed and estimated dialysis dose overestimates the actual delivered dialysis dose assessed by the effluent urea nitrogen concentration and spent dialysate volume. The Program to Improve Care in Acute Renal Disease (PICARD) group includes five academic medical centers in the United States: the University of California–San Diego (UCSD), the Cleveland Clinic Foundation, the Maine Medical Center, Vanderbilt University, and the University of California–San Francisco. Over a 31-month period (February 1999 to August 2001), all patients consulted for AKI in the ICU were evaluated by PICARD study personnel for potential study participation. Informed consent was required from all study participants or their proxy. We included 52 patients from a single center (UCSD) who were treated with continuous venovenous hemodiafiltration (CVVHDF) and had complete data for urea nitrogen in the effluent. A detailed description of PICARD inclusion and exclusion criteria, data elements, data collection, and management strategies has been described elsewhere (2). AKI was defined as an increase in serum creatinine ≥0.5 mg/dl with baseline serum creatinine <1.5 mg/dl, or an increase in serum creatinine ≥1.0 mg/dl with baseline serum creatinine ≤1.5 mg/dl and <5.0 mg/dl. Patients with a baseline serum creatinine ≥5.0 mg/dl were not considered for study inclusion. Patients who were contacted by study personnel and who signed informed consents were enrolled in the study cohort. The Committees on Human Research at each participating clinical site approved the study protocol and informed consent. All interventions were determined by the treating physicians and were not influenced by the study personnel; these interventions included the timing, modality, and intensity of dialysis. Reasons for starting dialysis were classified as follows: (1) solute only (blood urea nitrogen [BUN] ≥ 80 mg/dl and/or serum creatinine ≥ 6 mg/dl), (2) volume only (oliguria <400 cc/24 h or signs of volume overload), and (3) combined (a combination of volume problems, solute problems, and other indications including electrolyte disturbances and pH). CVVHDF was performed with a Gambro Prisma (Lakewood, CO) CRRT machine (82% of all treatments) with a 0.7 to 1.8 m2 AN69 membrane (MF-100 filter set for Prisma) or a B. Braun Diapact machine (18% of all treatments) with a polysulfone synthetic high-flux filter (Fresenius NR60). The essentials of the CVVHDF therapy setup have been previously described (21). The operational characteristics and circuit schematic are shown in Figure 1. Further description of dialysis technique and fluid balance technique are shown in Appendix 1 and Appendix 2, respectively. CRRT dialysis circuit using regional citrate anticoagulation with the Gambro Prisma machine. The 4% trisodium citrate (TSC) mean infusion rate was 180 ml/h and Qb was 100 ml/min. TSC was added at the arterial catheter port and ionized calcium levels were sampled postfilter. 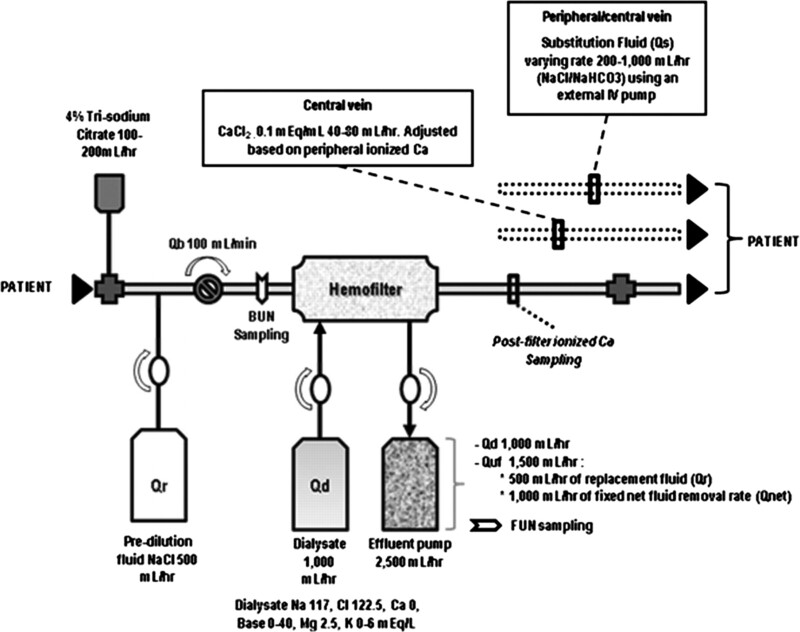 Citrate flow rates were subsequently adjusted based on postfilter ionized calcium values to be maintained within a range of 0.25 to 0.4 mmol/L. The prefilter BUN value was measured after the infusion of TSC and predilution fluid (Qr), thereby accounting for the predilutional effect of these solutions. The technique for fluid balance used a fixed ultrafiltration rate (1000 ml/h) to achieve a target effluent volume; substitution fluid (Qs) was varied hourly to achieve a negative, zero, or positive fluid balance. Qb, blood flow rate; Qd, dialysate flow rate; Qr, replacement fluid rate; Quf, total ultrafiltration rate; Qnet, net fluid removal rate. Filter efficacy was assessed by calculating fluid urea nitrogen (FUN)/BUN ratios for each 12-hour period of filter use. We assessed factors that affect treatment time in each of the CRRT treatments and ascribed them to one of the two following categories (detailed in Table 3): (1) factors affecting treatment time without affecting filter function and (2) factors affecting filter function. Urea nitrogen clearance (K, ml/min) was calculated for prescribed, estimated, and delivered dialysis doses. The prescribed K was calculated by the effluent rate from the initial prescription and expressed in ml/min. where Qr is the replacement fluid rate, Qd is the dialysate fluid rate, Qnet is the net fluid removal rate, and Quf is the total ultrafiltration volume (Qr + Qnet). Prescribed K corrected for predilution. Estimated was calculated from the measured effluent rate normalized for effective treatment time (accounting for the time off CRRT). Estimated K corrected for predilution. Estimated K corrected for predilution was calculated using the formula shown above and corrected for effective time of treatment (effective time on machine and the effluent recorded by the machine). where Qr is the replacement fluid rate, Qd is the dialysate fluid rate, and Qnet is the net fluid removal rate normalized for effective time of treatment (effective time on machine and the effluent recorded by the machine). Continuous variables were expressed as mean ± SD and analyzed by unpaired t test, or Wilcoxon rank-sum test, as appropriate. Nonparametric variables were expressed as median and 25th to 75th percentiles and analyzed by the Mann–Whitney test. Categorical variables were expressed as absolute (n) and relative (%) frequency and were analyzed by χ2 or the Fisher exact test, whenever appropriate. All statistical tests were two-sided and P < 0.05 was considered significant. Statistical analyses were conducted using SPSS 17.0 (Chicago, IL). The mean age was 49 (±14) years, 55% were female, 43% were nonwhite, and 10% had a history of chronic kidney disease. The mean serum creatinine concentration at CRRT initiation was 1.64 ± 1.2 mg/dl, median daily urine output was 80 ml (24.5 to 278), and mean Sequential Organ Failure Assessment and Acute Physiology, Age, Chronic Health Evaluation 3 scores were 9.9 ± 3.6 and 111.1 ± 24.8, respectively (Table 1). In 93.5% of the patients, the reason for starting dialysis was a combination of volume problems (oliguria <400 cc/24 h or signs of volume overload) and solute problems (e.g., BUN ≥80 mg/dl and/or serum creatinine ≥6 mg/dl, electrolyte disturbances, and pH). In 6.5% of the patients, the indication for dialysis was exclusively volume related (oliguria <400 cc/24 h and/or signs of volume overload). CRRT parameters of the 420 treatments included in the analysis are described in Table 2. The median observed treatment time was 1413 minutes (interquartile range [IQR] 1368 to 1440 minutes), with a down time per day that ranged from 52 to 254 minutes. The median prescribed and observed effluent volume per treatment were 2500 ml/h (2412.5 to 2500) and 2280 ml/h (2035 to 2500) (P < 0.001), respectively (Table 2). The range of dose was 30.2 ml/kg per hour (25.3 to 35.8) for prescribed, 28.4 ml/kg per hour (21.7 to 36.6) for estimated, and 22.3 ml/kg per hour (16.6 to 28.3) for delivered dose. In more than 90% of treatments, the prescribed time was achieved. As a result, prescribed and estimated (clearance adjusted for effective treatment time) doses were similar (prescribed = 41.7 ml/min [40.2 to 41.7] versus estimated = 39.3 ml/min [34.3 to 47.7]; P = 0.625) (Figure 2). However, estimated and delivered dose were significantly different (estimated = 39.3 ml/min [34.3 to 47.7] versus 29.7 ml/min [25.3 to 33.6] delivered; P < 0.001) (Figure 2). The delivered/prescribed and delivered/estimated ratios were 72.8% and 75.9%, respectively, resulting in a dose overestimation of 27.2% using prescribed clearance and of 24.1% using the estimated clearance. On the left, prescribed, estimated, and delivered dose expressed as urea clearance are shown. No significant difference was observed between prescribed and estimated dose; however, a difference was observed between estimated (dialysis dose adjusted for effective time of treatment) and delivered (dialysis dose express as clearance, derived from actual solute removal) dialysis dose. On the right, results adjusted for predilution are shown. Correction for the effect of predilution on clearance resulted in lower prescribed (39.6 ml/min [range = 37.9 to 41.2]) and estimated clearance levels (36.7 ml/min [range = 32.1 to 46.8]). The difference between estimated clearance and delivered clearance was less pronounced, but the delivered clearance remained significantly lower (36.7 ml/min [range = 32.1 to 46.8] versus 29.7 ml/min [range = 25.3 to 33.6] delivered; P < 0.001). After accounting for the effects of predilution, the prescribed and estimated clearance still overestimated the delivered dose by 26% and 25.7%, respectively (Figure 2). Filter efficacy parameters were available for 159 of 175 (91%) filters that were used in the 420 treatment days; FUN measurements were not available for 16 filters. More than 60% of the time (62%), treatment was stopped or discontinued for reasons that do not affect filter function, and 38% of the time, treatment was stopped for causes that compromised filter function (see Table 3). The median filter duration was 75 hours (IQR 48.5 to 115.6 hours), with a minimum duration of 1.3 hours and a maximum duration of 183.3 hours. The median duration of filter life was 68.1 hours (IQR 44.3 to 96.6 hours) in the group with compromised filter function and 87.0 hours (IQR 61.9 to 119 hours) in those without compromised filter function. As shown in Table 4, median FUN/BUN ratios for filters with compromised function progressively decline over each of the 12-hour periods of use. The median FUN/BUN ratio at the time of filter change was 0.96 (0.94 to 0.98) in filters without compromised function compared with 0.87 (0.77 to 0.95) in the group of filters with compromised function. The median of delivered clearance at the time of filter change was 38.1 ml/min (IQR 30.8 to 42.7) in the group classified as having factors affecting filter function and 35.5 ml/min (IQR 31.9 to 40.1) in the other group. However, the mean delivered/prescribed ratio was 0.79 ± 0.11 in the group in which filter function was compromised and 0.84 ± 0.12 in the group in which the filter function was not compromised. Figure 3 shows that the prescribed dialysis dose remained constant throughout the duration of therapy; however, the estimated dose, corrected for the predilution effect and adjusted for effective time of treatment, declines over consecutive days of filter use. This decline is even greater on the basis of the delivered dialysis dose assessed by urea solute removal across consecutive days of filter use. Relationship between filter day and prescribed, estimated, and delivered dose expressed as clearance (K). 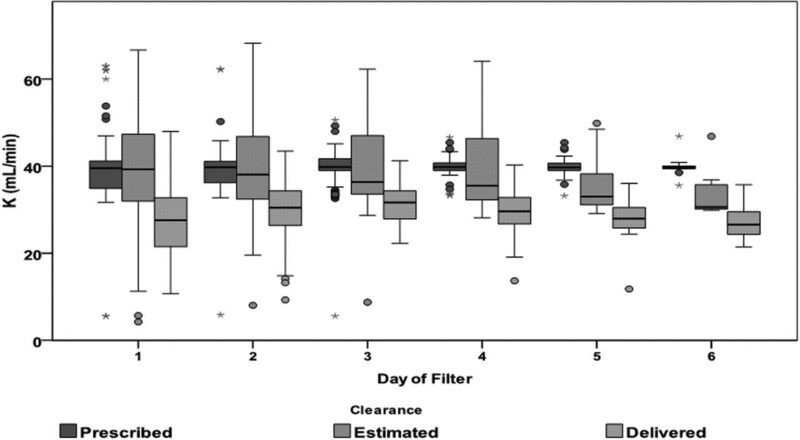 Figure shows that prescribed dose (effluent rate) remains constant across consecutive days of filter use. Dose corrected for predilution effect, adjusted for effective time of treatment, and observed effluent rate decreases across consecutive days of filter use, and a gap between prescribed and expected dose is noted; however, delivered dose calculated based on actual solute removal shows a greater gap between prescribed and delivered dose. The number of filters declines each day (day 1 = 115, day 2 = 106, day 3 = 68, day 4 = 39, day 5 = 23, and day 6 = 8). The figure highlights the importance of measuring dose based on actual solute removal. Since the establishment of a link between dialysis dose measured by urea clearance and clinical outcomes in patients with ESRD, the clearance of urea adjusted for the volume of distribution of water has been used an index of dialysis adequacy (Kt/Vurea) (23,24). Although widely used for patients on maintenance dialysis, the use of Kt/Vurea in AKI is an area of ongoing debate (25–28). Some of the key issues in this debate have stemmed from the difficulty in comparing clearance parameters across therapies (29). Clearance calculations in CRRT are based on the principle that the operational characteristics favor a complete saturation of the effluent with solutes that are freely permeable to the membrane. For small solutes like urea nitrogen, the ratio of the concentration of effluent FUN to blood is generally 1. Consequently, clearance is then dependent on the effluent volume that represents the end product of filtration and is equal to the sum of the net fluid removal rate, the spent dialysate, and the replacement fluid in combined therapies such as CVVHDF. On the basis of these factors, effluent volume is perceived to represent clearance in CRRT and has been widely utilized to prescribe and measure the dose of CRRT defined as the hourly effluent rate normalized for body weight. A key assumption in these calculations is that filter permeability and hence small solute removal remains constant throughout the duration of CRRT. In the study presented here, we investigated whether filter permeability is a factor affecting small solute clearance. We have demonstrated that when using the FUN/BUN ratio as a marker of filter permeability, there is a progressive reduction in filter function across consecutive days of use (Figure 2). This reduction is earlier and more easily discernible in filters that are changed for clotting but is seen in all filters over time even when these filters were apparently functioning well. Because the effluent volume is dictated by the machine settings, there is no reduction in the overall volume but the saturation of the effluent is reduced. A possible factor contributing to the decline in filter permeability is concentration polarization of the filter (30). This phenomenon is caused by a layering of proteins forced into the membrane by ultrafiltration and results in the formation of a pseudomembrane that increases the thickness of the original membrane. The consequences are not only the need for a higher transmembrane pressure to maintain the ultrafiltration rate, but also a lower concentration of potentially important solutes in the ultrafiltrate (20). The operational characteristics for CVVHDF in our study (a low blood flow rate, prefilter dilution, citrate anticoagulation, and constant effluent volume) would generally be associated with a low likelihood of concentration polarization. Our findings have several practical implications. Prior studies of CRRT dose have compared the prescribed (prescribed clearance) to the measured effluent volume (estimated clearance) and have equated the effluent volume to clearance as a measure of CRRT efficacy (9,11–15). However, solute clearances were not measured in any of these studies and the net result of the reduced filter permeability, which is a reduction in the measured clearance of small solutes, was not considered. In the study presented here, we found that the measured effluent volume significantly overestimates the true delivered dose of small solutes by 26.4% and that the gap between prescribed and delivered dose is even greater (30%). Even after correcting for the effect of predilution on urea clearance, prescribed clearance and estimated clearance still overestimate the actual delivered dose (delivered clearance calculated using dialysis-side urea kinetics equations) by >25%. A second facet of our findings is the influence of factors affecting treatment time on the delivered dose of CRRT. We have delineated various factors that in practice influence the time on therapy (Table 3). Although some of these are modifiable (e.g., timing of elective procedures), many are part and parcel of the clinical course of critically ill patients. Recognizing the influence of and accounting for these alterations in treatment time provides additional insights into the problem of delivering specific doses of therapy (31). Since the early findings of Ronco, Schiffl, and others (9–11) suggesting a salutary effect of higher dose hemodialysis or hemofiltration, several studies have suggested no benefit of more intensive dialysis or hemofiltration in critically ill patients with AKI (12–15). Although the errors in estimating delivered dose are unlikely to render these studies invalid, going forward, it will be extremely important to account for an expected reduction in efficiency or to measure delivered dose. Such an approach may be particularly important if practice shifts toward providing the minimum dose of dialysis considered “adequate” or acceptable in practice. In the Acute Renal Failure Trial Network (ATN) and the Randomized Evaluation of Normal versus Augmented Level Replacement Therapy (RENAL) studies (13,15), the “conventional” groups received 20 and 25 ml/kg per hour of predilution hemodiafiltration and postdilution hemodiafiltration, respectively. Although doses above these levels were not beneficial, we do not know whether doses below these levels would be safe. If our new “standard of care” is the dose prescribed in the control groups of these two well conducted multicenter clinical trials, we may need to account for inefficiencies between prescribed and/or estimated and delivered dose to feel secure that we are providing patients with the best available therapy. Our study has some limitations. First, the study is limited to a single center because UCSD was the only PICARD center collecting effluent samples. Second, larger middle molecules were not assessed. Third, we only performed predilution CVVDHF. Consequently, the performance of urea mass removal-derived clearance in assessing delivered dose during postdilution was not evaluated. The study also has several strengths. We measured effluent urea to assess dialysis dose, which overcame one of the caveats to evaluating CRRT efficacy—the influence of some operational characteristics such as filter clotting and protein fouling of the membrane on solute clearance. In studies with citrate-based anticoagulation strategies, the propensity for filter clotting is lower. The use of heparin or lack of any anticoagulation might result in higher filter clotting and translates into increased discrepancy between prescribed and delivered dialysis dose. In our study, the circuit was kept patent using regional citrate anticoagulation with prefilter dilution fluid, reducing the risk of filter clotting during the treatment and improving the amount of delivered dose. It also reduced variation associated with different anticoagulation strategies. Finally, we have taken into account the effect of predilution, which can reduce urea clearance as much as 15% (32). We have calculated and corrected the delivered dose for this effect (14,30,33). In conclusion, filter function in CRRT is influenced by several factors that affect its efficacy. Significant reductions in efficiency develop over time even when the filter remains overtly patent and functional. The relative efficiency of the hemofilter can be monitored by sequentially measuring FUN/BUN ratios. Measured effluent volume normalized for effective treatment time significantly overestimates delivered dose of small solutes in CRRT. To achieve a prescribed dialysis dose, effluent-rate-based dose should be increased by 20% to 25% to account for decreases in treatment time and reduced filter efficacy during CRRT. The work of R.C.D.G. and E.M. was made possible through an International Society of Nephrology Fellowship award. E.M. is additionally supported by a training grant from Conselho Nacional de Desenvolvimento Científico e Tecnológico. The study was supported by the National Institutes of Health (NIH-NIDDK RO1-DK53412, RO1-DK53411, and RO1-DK53413) and by the NIH-NIDDK O'Brien Center. Part of this material was presented at the annual meeting of the American Society of Nephrology; October 27 through November 1, 2009; San Diego, CA. Dual-lumen 11 FR temporary catheters with a prescribed blood flow rate (Qb) of 100 ml/min. Regional citrate anticoagulation was used to maintain filter patency using 4% trisodium citrate infused at the origin of the extracorporeal circuit (initially 170 ml/h, range 100 to 200+ ml/h). Initial citrate flow rates prescribed were between 2% and 3% of Qb (e.g., for a Qb of 100 ml/min, citrate flow rates ranged from 2 to 3 ml/min, or 120 to 180 ml/h). Citrate flow rates were subsequently adjusted based on postfilter ionized calcium values to be maintained within 0.25 to 0.4 mmol/L. These values were checked with a frequency ranging from 6 to every 12 hours. Citrate flow rates were adjusted within a range of 5 to 15 ml/h to achieve the postfilter ionized calcium values. No changes in Qb were done when citrate was adjusted. Replacement fluid (Qr) was comprised of 0.9% saline at a fixed rate of 500 ml/h at treatment initiation, but it could be subsequently modified between 250 and 700 ml/h. A custom dialysate (Qd) with low sodium (117 mEq/L), zero alkali, and zero calcium was infused at a rate of 1 L/h (range 0.9 to 2.1 L/h). Net fluid removal (Qnet) was set at a fixed rate of 1000 ml/h at treatment initiation, but it could be subsequently modified between 700 and 2000 ml/h. Because the CRRT machines used in this study automatically set the effluent pump speed to include the replacement fluid (Qr), dialysate (Qd), and net fluid removal rate (Qnet), the total hourly effluent volume is derived from the dialysate (Qd) and ultrafiltrate (Quf = [Qr + Qnet]) and was prescribed and maintained at 2500 ml/h. In some patients, when additional clearance was required (to enhance solute removal and correction of hyperkalemia) for hypercatabolic states such as rhabdomyolysis), effluent volumes were increased by adjusting the dialysate flow rates from 1 L/h to a maximum of 2100 ml/h (range 1050 to 2100 ml/h), and in some instances net fluid removal was also adjusted to a maximum rate of 2000 ml/h (range 1100 to 2000 ml/h) for a temporary period. The Qd, Qr, and Qnet flow rates on the initial prescription (day 1 of CRRT = 56 of 420 total treatments) were as follows: 46 patients started with a Qd of 1000 ml/h; in 8 patients the Qd (day 1 CRRT) was between 1100 and 1500 ml/h. Fifty-one patients started with a Qr of 500 ml/h; in 5 patients the Qr was between 600 and 700 ml/h. Thirty-seven patients started with a Qnet of 1000 ml/h; in 6 patients the Qnet was between 1200 and 1500 ml/h, and in the remaining 13 patients the starting Qnet was >1500 ml/h. In the consecutive 364 treatments, the Qd was 1000 ml/h in 76.1%. For the remaining 75 (23.9%) treatments, Qd ranged from 1050 to 2100 ml/h. Qr for consecutive treatments was 500 ml/h in 84.9%. For the remaining 55 (15.1%), Qr ranged from 550 to 800 ml/h. Consecutive treatment Qnet was 1000 ml/h in 67.6%. For the remaining 62 (32.4%), Qnet for consecutive treatments ranged from 1100 to 2000 ml/h.